Age: Unknown but roughly between the age of 35-40. Profession: Dirt, studies of dirt, cooking of dirt, spreading of dirt, stea-borrowing shinies. Hundorian was born into a small tribe in Blackmarsh. 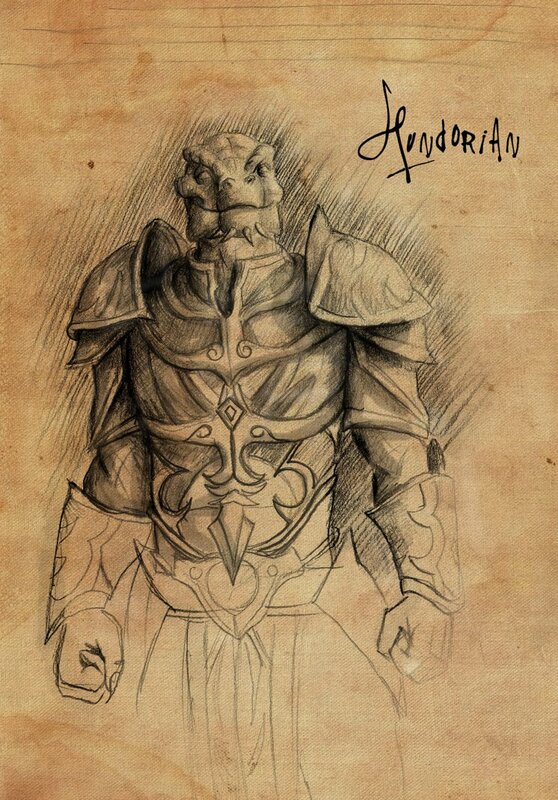 Before he was born he was dropped and left in the sun making him different from other argonians. Hundorian's first friend was dirt and always had a clump on him everywhere he went. Strange enough there are several others that have the same belief. When he was younger he would wander around the marsh looking for things to do and find since he didn't have friends because they thought he was weird for liking dirt. One day, when Hundorian was wandering around the Marsh, he got lost. He started to cry and kept searching but to no avail he could not find his tribe. Still lost and very young, he walked around wearing a tiny dress, eating any food he could find before one day he walked into a random mers house because he thought it was an orphanage. Hundorian asked if he could stay and the mer would not let him so he decided to leave and seek out the Guardians of Dirt, with luck and the help of dirt, Hundorian was able to find them. For several years he traveled around Tamriel collecting all different types of dirt and studying them. Hundorian was at Windhelm one day and heard whispers of a tribe called the Banescale Fellowship. He was intrigued and journeyed back to his homeland to find this Fellowship. He met many people in the tribe and was soon able to take the trials and become Kepjen, but even though he completed the trials, he was still weakened by them and made even dumber than before. During his journeys Hundorian has met many that he would call friends. He has continued to spread the joy of dirt to all and has started eating flowers as well. Hundorian has also started to somewhat come disconnected with the Hist. With Logathor now defeated he must be even more wary of mud and continue to help his friends when needed and tend to plants as well as dirt. Hundorian has also joined Telvanni Contracts where he can use the fountain as many times as he wants for dirt baths. He even has a place to store his dirt now too. He hopes to gain lots of dirt as well as several shinies. During his travels he has also managed to convince many that mud is evil and dirt is good. The reasoning as to why he worships dirt so much is still unknown. Although he has many that wish to help him in this cause to stop the spread of mud by the Mud Cultists. His current mission is to kill as many mudcrabs as he can to save the sand dirt from being taken over. After that is completed he will do whatever he is tasked to do. The reason as to why he i so dumb might also be because of a certain daedric prince or because he keeps getting constantly tripped by his own tail. It might also relate to his egg being out in the sun too long. His time in Telvanni Contracts has made him crazier but more skilled in things he was not skilled in before such as being able to use the magicka he had in him. He also keeps glow dirt and the Pure dirt plant there as well but hidden in an undisclosed location. Recently Hundorian has managed to not trip over his tail anymore after a curvature in his back was fixed. Now he is able to go up and down the stairs without issue. Personality: Hundorian is a type of person who would run at the enemy screaming. He is a dirt-loving warrior who has a fondness for dirt and other things Argonians shouldn't eat but what he lacks in his mind he makes up with his brute strength. Philosophy: Believes heavily in dirt and is ready to sacrifice himself to dirt and his friends if need be. Is somewhat a pacifist. Loyalty: Would die fighting for his friends, family, and dirt. Appearance: Average height and tan colored. Has a noticeable scar going across his right eye. He is also somewhat fat mainly attributing to the fact that his diet consists of dirt, sweetrolls, meat, and unhealthy foods. Physique: What he lacks in mind, he makes up in strength. Combat: Likes to run head-on at the enemy. Skills: Blunt weapons or objects and is fairly trained in hand to hand combat. Is more skilled up close and personal than ranged. Likes: Dirt, Hair, Fur, Sweetrolls, Flowers, Candle wax. Hundorian is one of my favourite characters who just shows up to all these serious moments and makes them ten times more interesting. I will never forget how you gave one of my guildmates pouches of bloody dirt.